Debbie Elkohoury played outside with Ezrah Fishman, 3, after a multigenerational Kabbalat Shabbat service in Stowe, Vt.
STOWE, Vt. — Rabbi David B. Fainsilber is clucking like a chicken. Kids are cracking up, adults can’t help smiling. His sermon this Shabbat is a riff on an old Hasidic story about a prince who infuriated his father at mealtimes by sitting under the table, pretending to be a chicken. Then a wise teacher crawled under the table and clucked to the child in greeting. The prince, he suggested, could be a boy and still hold onto his inner chicken. Such are the sensibilities of the 21-year-old Jewish Community of Greater Stowe, the first organized Jewish community in this renowned resort town’s 223-year history. 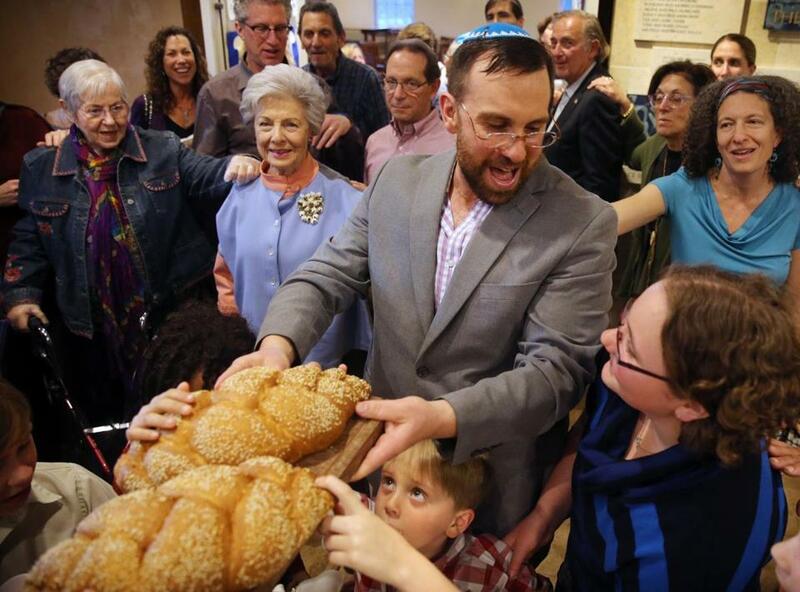 At a time when Jewish leaders across America are fretting over declining membership in many synagogues, the Stowe congregation is growing rapidly. It’s a testament in part to the community’s openness to all comers, including interfaith families and Jews with little experience in religious or cultural life. And to its leadership: Since Fainsilber became the first full-time rabbi two years ago, the congregation has drawn some 50 new families and has quadrupled the size of its religious school to 35 children. “I have two definitions of success here — one is we run out of space in the building; the other is Chabad wants to open a branch in Stowe,” joked the president of the congregation’s board, Ron Feinstein, referring to the Hasidic movement known for its widespread community centers. In the last 11 years, the Stowe community has built its first building, consecrated a new Jewish cemetery, and become an enthusiastic participant in local civic life. It’s a dramatic transformation from the days, before World War II, when Stowe was among the many New England towns where Jewish tourists were often shunned — or even from the mid-1980s, when there was little organized Jewish life here at all. Rabbi David Fainsilber offered a blessing during the Kiddush and HaMotzi rituals in Stowe, Vt.
After generations of “almost invisibility . . . to become so viable and so much a part of where we are in the community is stunning,” said Gretchen Rous Besser, a retired French literature professor and skier whose son was the community’s longtime spiritual leader. 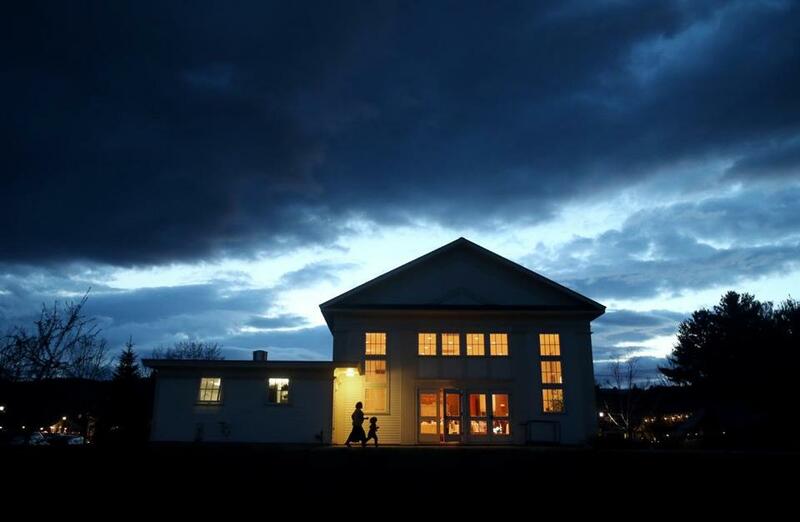 The Stowe congregation, which is not affiliated with any branch of Judaism, is among a number of young Jewish communities flourishing across the state’s rugged terrain. Vermont is one of the least religious states in the country, and Jews account for less than 1 percent of the population, according to the American Jewish Year Book 2015. That is about half the national proportion, although locals say the number of Jews in Vermont is higher than the recent estimate. Forty years ago, said Susan Leff, executive director of the Jewish Communities of Vermont, the state had, maybe, three synagogues with rabbis. Today, she counts 14, plus 10 havurot, or lay-led congregations. The weekly e-mail Leff sends out typically includes some 30 Jewish events around the state, not including regular services. Leff said the Jewish organizations that are thriving here tend to be “entrepreneurial and grass-roots.” She pointed to ventures such as Burning Bush Adventures, an outdoor excursion company infused with Jewish spirituality, and nonprofits such as Theatre Kavanah, a Jewish theater company in Burlington. A number of the growing Jewish congregations in Vermont, including Stowe’s, have transformed from informal Shabbat suppers into lay-led congregations now maturing into stable communities. Robert Schine, a professor of Jewish studies at Middlebury College, said a strain of post-denominational Judaism that downplays religious and political divisions seems to be flourishing here. Schine detects a wariness among some communities, including his own havurah in Middlebury, of becoming what he calls, with a laugh, “the synagogue of your nightmares.” By that, he says, he means a synagogue where nobody can understand the prayer book, and where the Hebrew school bores children and seems totally focused on the end-goal of a consumerist bar or bat mitzvah. Schine has traced the first organized Jewish congregation in Vermont to 1867; the founders of the “Israelite Assembly” were Jewish merchants in East Poultney, near the New York border, selling supplies to workers in the slate production industry. Ohavi Zedek Synagogue in Burlington, the oldest Vermont synagogue in existence, was founded in 1885; several other congregations are more than a century old. Some of the state’s most famous residents are Jewish or have Jewish roots, including US Senator Bernie Sanders, former governor Madeleine Kunin, and Ben Cohen and Jerry Greenfield, the founders of Ben & Jerry’s Ice Cream. But many Vermont towns, including Stowe, once tried to keep Jews out, as did much of the hospitality industry in New England during and before World War II. A decade ago, Stowe Guide & Magazine dug up a tourist brochure from the winter of 1944-45 that listed 12 of 15 area hotels, inns, and ski lodges as “restricted” — off-limits to Jews. 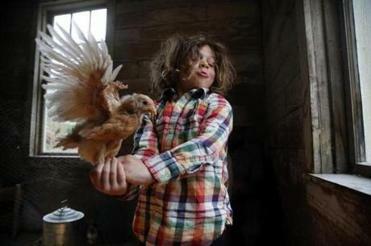 Adar Fainsilber, 5, fed the fowl at his home in Morrisville, Vt. His father is the rabbi at the Jewish Community of Greater Stowe. By the time Besser began visiting Stowe in the early 1950s, that kind of explicit anti-Semitism had faded enough that she never encountered it. But the nearest synagogue was in Montpelier, 45 minutes from their home in Morristown. A group of locals and part-time residents incorporated the Jewish Community of Greater Stowe in the mid-1990s. Steve Berson, a former board president, said the community has always tried to accommodate the widest range of Jewish observance and experience. The prayer books contain plenty of English and transliteration. There is a kosher kitchen and a nonkosher kitchenette. Feinstein, the current board president, who splits his time between Weston, Mass., and Stowe, said the community steers away from events focused on divisive topics such as Israel unless there is a strong justification for doing so. It warmly welcomes interfaith families and often holds social and educational events that are not religious, so that the secular crowd feels at home, too. Congregants attribute much of the recent growth, especially among young families, to the arrival in 2014 of the guitar-strumming Fainsilber and his wife, Alison Link, parents of 3- and 5-year-old boys. On a recent Saturday morning, he led a roomful of tots and their parents at Kinderlach, Yiddish for “little children,” in singing and storytelling before everyone adjourned to make felt Torah covers. Then, they shared a potluck picnic, and the kids romped on the playground outside as parents chatted in the sunshine. Food and immersion in nature have long been organizing principles in the Stowe congregation — there are wine tastings and potlucks, as well as outings to glean leftover vegetables from farmers’ fields for a local food bank. For Shavuot, a holiday celebrating God’s revelation of the Torah to Moses on Mount Sinai, Fainsilber took the congregation on a camping trip to Mount Mansfield. 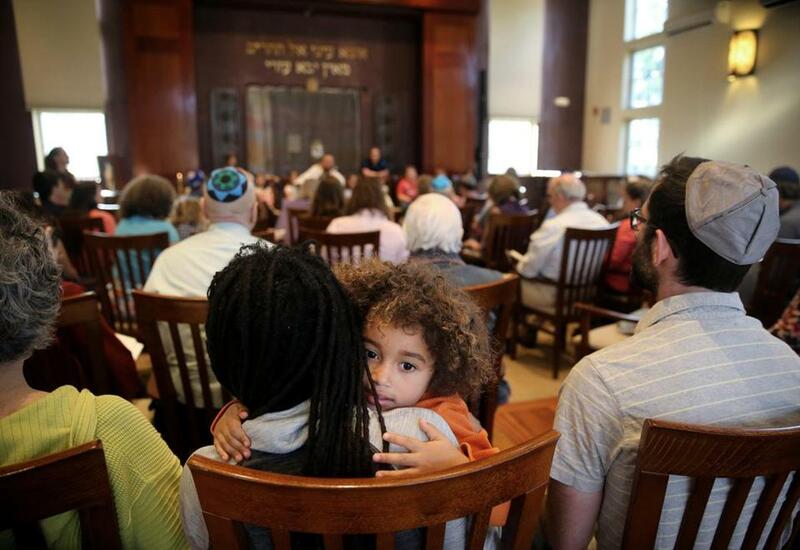 Ezrah Fishman, 3, sat with his parents during a Kabbalat Shabbat service in May. Lisa Wangsness can be reached at lisa.wangsness@globe.com. Follow her on Twitter @wangsness.